This delightfully soft, trendy messenger bag is a lightweight addition to your fast paced day! 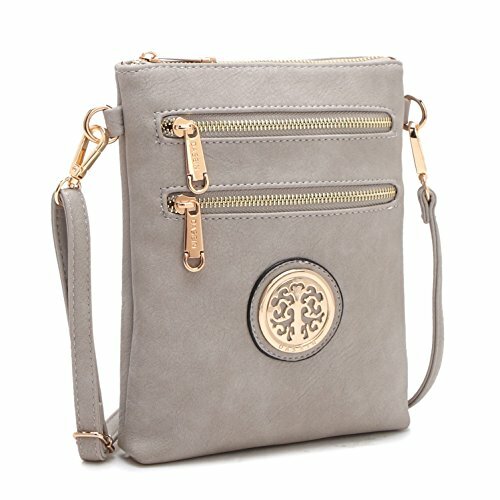 back wall zipper pocket and adjustable cross-body strap, be on-the-go anywhere with this chic messenger bag. Classic design that will compliment every modern woman's wardrobe. Upgrade your personal style with a touch of beauty with these sensible vintage classy purse - will perfectly and easily fit most of your outfits for dressy or casual wear! Our cross body shoulder bags are crafted for wear for anytime, any season. we have summer, winter, fall, spring colors all available to purchase . Stay classy with black, brown, white or add a little flare in your wardrobe with red, pink, blue, turquoise. We have many colors for you to choose from to fix any season outfit and give that gorgeous high class leather look! Vegan leather :Eco-friendly and safe- Stay true to your fashion and environmental principles with this earth conscious product. DIMENSIONS: 6.9"W x 9.1"H x 1.2"D / Shoulder Strap Length: End to End 56" ; Ideal Crossbody Bag ,Travel Purse,Shoulder Bag. LIGHTWEIGHT AND SECURE: Top Zipper Closure / Adjustable and Detachable Shoulder Strap: let you keep your bag secure with a crossbody carry, or over the shoulder to better match your ourfits. Your bag will not slip turn or move out of place while carrying our gorgeous bags.Perfect for using in shopping, dating,travel or any other daily occasions you don't want to take a bulky purse. MATERIAL: High Quality faux leather with durable golden tone hardware, sturdily constructed with detailed streamlined stitching and fully lined with smooth polyester lining. Waterproof, wear resistant and durable in use. SPACIOUS STORAGE AND MULTI POCKETS: Interior: 2 Front Wall Open Top Item Pockets/ 1 Back Wall Zipper Pocket ; Exterior：2 Front Zipper Pockets ; Large capacity for holding all your essentials and varieties of colors available. EXCELLENT PACKAGE & RISK FREE: Enjoy the benefits of free vegan fabric shopping bag along with the handbag you purchased . Our goal is to ensure that you're 100% satisfied with your purchase right out of the box. If you're not satisfied for whatever reason, we will gladly accept your return provided that you request authorization within 30 business days of the delivery date. If you have any questions about this product by MKY, contact us by completing and submitting the form below. If you are looking for a specif part number, please include it with your message.